Problem: Budget hotels, trains, and other stops along the way rarely provide washcloths. Solution: This pair of quick-drying travel washcloths will help keep you clean and happy. 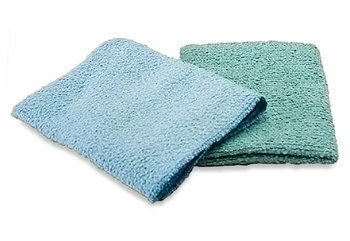 Quick-Drying: These microfiber washcloths wring out thoroughly, dry quickly, and pack easily — just what every traveler needs! Cool Colors: Each pair comes in two contrasting colors: sky blue and sea green (and they coordinate nicely with any of our travel towels).